Cornerspeed was born of many things but above all a passion for Ducati. I am Neil Barrett, Nelly to most people and this is a brief history of how I started Cornerspeed Ducati. In late 2002, my career in Engineering received quite a knock. I had worked at Raleigh Cycles in Nottingham for 18 years. The facility was to close with the loss of 900 jobs… including mine. I’d started there as school leaver on a Technical Apprenticeship and once completed took up the position of Technical Services Engineer in the Works Services Division. From there I moved into the Manufacturing Division where I took up the position of Production Engineer. Now you may think that manufacturing bicycles is far removed from motorcycles but much of my time was spent working the very latest technology. Robots that build wheels, that weld complex 3D assemblies, lasers that cut tubing to within microns. The tech was cutting edge and fed my appetite for all things engineering. With a solid ‘old fashioned’ apprenticeship and an education that stretched to studying Mechanical Engineering at University of Nottingham behind me I loved the technical challenges laid out before me. I had always been intrigued by how things work. To take them apart, discover and then rebuild had been something I’d done from a very early age. Then I discovered the internal combustion engine. As a teenager the field bikes came and went, then road bikes and cars. Every one was taken apart and rebuilt. The engineer in me came to the front when looking to improve. Be it engine, chassis or aesthetics. There was always some tinkering that could be done to modify what I had. Motorcycles always had a place in my heart. From the early field bikes, to the 350LCs that we cut our teeth on in the late 80s. In 1990, a friend of mine introduced me to his Ducati. A retired race bike, based around a 500 Pantah that was destined to be returned to road legality. Sadly Malc was taken ill before the task was completed. I bought the project on an impulse and finished the work off. The bait was taken. I was smitten. The noise, the handling, the ‘soul’… This Ducati was special. I rebuilt the bike twice more. Making more improvements as I went along. My main hurdle was finding the people who would or could supply parts or work on the engine. So I set about teaching myself the intricacies of the engineering behind the Desmo motor… and Italian electrical practices! The Pantah finally moved on to make way for a 1989 750 Sport. A stunning bike that stayed with me for a while until i let it go after buying a house… well it happens. 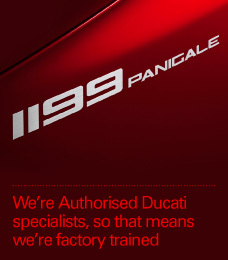 1994 had seen Ducati rewrite the rule book with the launch of the 916. Stunningly beautiful, technically ahead of anything and I wanted one!! In 2000, I bought it’s sibling; a 748. This bike stayed with me for many years and evolved into a very quick, sorted bike and became a talking point and a lead in to getting people asking me about doing similar mods and work to their Ducatis. When I discovered I was to lose my job, the first thing that popped into my head was to turn things around a little. Well quite a lot actually. No thoughts of getting the paper out to look for another job, but to start my own business… a Ducati workshop no less. The early weeks and months saw a slow but steady stream of bikes coming through the workshop. I had setup on the premise that I would offer not cheap services, but good value. The lessons and skills I had learnt thus far in my career were my best tools. Buying work is never good business. Do the job properly, with the right parts, meet customer expectations and be fair. Above all, remain transparent. The workshop had no walls. The customers were free to view the work place at all times, even stand by the bench and watch what was to be done. Treating people how you expect to be treated is one ethos I hold strongly. It seems to work well. I have built up a solid customer base with many still returning year upon year from those early days. Word of mouth is the best advert and the fact that I do very little if any advertising must mean that I’m doing something right. 2006 saw the biggest change to the business since it’s inception. Bigger than I could ever have expected or wished for. I was approached by Ducati UK and asked if I was interested in setting up as an approved Service Centre and to become part of the UK service network. It didn’t take many milliseconds to come up for an answer to that one. So it has become… Following on from the Authorised status, I have since received factory training annually, have taken on the status of Desmosedici Service agent, and continue to stay at the sharp end of all that’s new and upcoming in the Ducati model line up. Despite that though, the passion and determination to offer quality service, sensible costs and workmanship that befits the machines remains. I still don’t really see it as a job. I pinch myself when a ‘sedici rolls onto the bench, a gaggle of Dukes bellows into the car park or see the smile on a customers’ face when collecting their pride and joy. I make a living, but above all… its a way of life. 2008 saw me nominated for the UK Customer Service Award in Milan at the Ducati Global Conference, which has to be one of my proudest moments. March 2010 saw the business move to new premises with more space and prominence. Malc Spooner for the Ducati introduction and many lessons. RIP mate. Phil Worth and Paul Klatkiewicz for the time to watch and learn. John Hackett for the support and advice. Rob Young for the support, help and the front to stick ya neck out. To all my customers, old and new that have supported me and helped make Cornerspeed what it is today. Without each and everyone, it would not have become what it is today. Finally my parents. For everything. The help and support. The belief and the work they have put in alongside me. It wouldn’t have happened without them… I’m sure of that. So there you are. The background to Cornerspeed is here. If you’ve not visited us before, then please do so. The kettle is always warm as is the welcome.